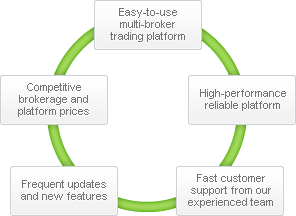 ProRealTime Trading is a leading online trading platform that provides trading from charts and orderbooks with several world-renowned brokers for order execution on a wide range of markets. ProRealTime is also used by Professional and Non-Professional traders for its high quality charts, powerful decision support tools and reliable market data. * ProRealTime awarded "Best trading platform" by "BrokerVergleich.com" from 2016 to 2019. ** Interactive Brokers elected "Best online broker" in 2018 by Barron's, "Best Futures/Fx Brokerage" by "Stocks and Commodities" in 2018, and IG elected "Best CFD broker" in 2017 by "Shares Awards".